← How to Convert PCL to POSTSCRIPT? URL stands for a website address. If you want to convert URL to PDF, that means you want to convert a webpage to PDF. You can find a document converter on the internet to convert URL to PDF such as VeryPDF docPrint. However, if you want to insert PDF pages and convert URL at the same time in a quick way, I suggest you try a command line application such as VeryPDF HTML Converter Command Line. With the help of VeryPDF HTML Converter Command Line, you can take only four steps to solve your problem. If you are interested, please download it by clicking VeryPDF HTML Converter Command Line. It will only need a couple of seconds to install this application in your computer. After that please follow the instruction below to insert PDF pages and convert URL to PDF. Visit the website by typing URL in a browser such as Firefox. 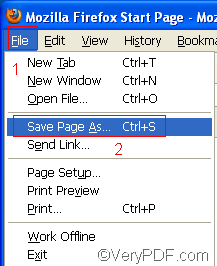 Click “Save” to close the “Save As” dialog box. In this article the webpage is saved in the format of HTML and is named “1”. The command line should consist of the following four items: the directory of the executable file, the command which can be used to insert PDF pages, the directory of the input file and the directory of the output file. The pattern below may illustrate those items more clearly. htmltools refers to the executable file of VeryPDF HTML Converter Command Line. -append <int> is the command which can be used to insert PDF pages. The angle brackets are used to enclose essential contents. int stands for integer. You are allowed to choose one of the following numbers as the parameter value of the command: 0, 1, 2 and 3. -append 3 can be used to rename the filename, avoiding the duplication of name. HTML file represents the web page, which is of course the input file. Remember？We have save the webpage of URL in HTML in step 1. PDF file refers to the output file. For instance, the following command line includes the four items mentioned above, and uses the directories to represent the files. You can substitute with the directories of the files in your computer for the directories in this example. -append 1---- the command can be used to insert PDF pages before the first page of the existing PDF file. C:\in\1. html ---- the directory of the input file named 1 in the format HTML. D:\out\lo.pdf ---- the directory of output files. If there is a PDF file called lo in the folder out on disk D, the computer will insert the input file before the first page of the PDF file. Otherwise, the computer will create a new one. Press the key “Enter”. Your computer will begin to insert PDF pages and convert the URL to PDF. When you see “result=OK” displayed in the command prompt window, that means it has converted the URL to PDF. If you want to buy the full version of VeryPDF HTML Converter Command Line, please click Purchase. To get more information about other products, please visit the home page of VeryPDF. HTMLTOOLS / License is "gone"? This entry was posted in HTML Converter (htmltools) and tagged command line, insert pdf pages, URL to PDF. Bookmark the permalink.